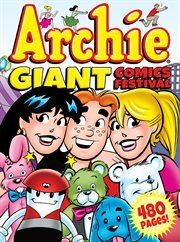 The item Archie giant comics festival, (electronic resource) represents a specific, individual, material embodiment of a distinct intellectual or artistic creation found in Lawrence Public Library. Get ready for a FESTIVAL of FUN! Everyone loves Archie Comics! Now you've got EVEN MORE to love with this GIANT comics collection! This fun-packed, laugh-a-minute volume collects 480 pages of the wild humor and teenage tomfoolery that have made Archie comic stories popular for over 70 years!